This mini cheesecake recipe is super easy to prepare and makes a festive addition to your party dessert menu. You can virtually adapt any cheesecake recipe to a "mini" version just by dividing your batter among cupcake holders instead of one springform pan. Line 36 muffin pan cups with paper liners. Beat cream cheese in a medium mixing bowl until soft and creamy. Gradually add sugar, beating until light and fluffy. Add eggs, one at a time, beating well after each addition. Stir in vanilla extract. Place a vanilla wafer in each paper lined muffin cup. Spoon cream cheese mixture over wafers, filling lined muffin cups almost full. Bake for 15 minutes. Leave in muffin pans and chill 8 hours. To serve, top each with a whole or sliced strawberry, or 1 tablespoon of your favorite pie filling. Note: I just made this mini cheesecake recipe for a party and they were a big hit! This recipe is a definite "thumbs up". Browse the bookshelves at Amazon.com for all your cookbook needs. Rate this recipe and let me know what you think. 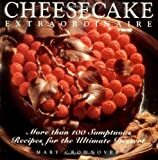 More recipes like this mini cheesecake recipe. Keep updated on all things strawberry by signing up for my FREE newsletter! You'll receive new recipes, gift ideas, readers' comments, tips, trivia and more.